Entertainment and Las Vegas go together like peanut butter and jelly – one without the other just doesn’t make sense! The worst part about living in the Valley is having too much to choose from when you’re planning a night out. Start by deciding whether this is a “splurge” or “save” kind of night. If you want to keep your wallet closed as much as possible, you’re in luck! Juhl is conveniently located near many inexpensive Las Vegas entertainment options. If you’re ready to paint the town red, break out those Benjamins because Vegas is packed with countless exciting things to do that are a little spendy, but the memories are priceless. If you live Downtown and don’t know about Banger Brewing, then your Juhl condo might be just a little too cozy (we kid!). Banger Brewing was developed by five friends who discovered a common passion for food, wine, and, of course, craft beer. Together, they’ve created unique beers like a jalapeño hefeweizen called El Heffe and Morning Joe, a coffee-infused golden ale. If you want to learn even more about these one-of-a-kind concoctions, Banger Brewing offers guided tours of the brewhouse, where you can learn more about how your favorite craft beer is brewed. For only $6.50 a person, you’ll spend your tour with some great people and receive free beer samples to try along the way. Boasting a friendly staff and a fun atmosphere, Banger Brewing just might become one of your regular spots! If you prefer fermented fruit over hops, we’ve got something for you, too. “Rock Out with Your Cork Out” is the official slogan for Rock N Roll Wine and it’s an intriguing one, at that! Founded by Chris Hammond and Sony Barton, Rock N Roll Wine believes that the wine experience is just as important as the wine quality, so they partnered with big dogs like Rock in Rio, MGM Resorts International, and Live Nation to bring you the ultimate wine tasting experience! On those nights where cash flow is low, Rock N Roll Wine offers Wine Lounge Thursdays, where you join a group of wine and music lovers at a revolving selection of venues for a complimentary tasting of some of their featured wines. You can find everything you need to know on the company’s website, including Thursday meet up spots and featured wine lists. Free wine tasting on Thirsty Thursday just can’t be beat. First Friday is no secret to the Las Vegas community, especially when you live so close to all the action! Residents of Juhl have front row seats to some of the Valley’s most talented artists, unique food trucks, local bands, and great beer. If you’re looking for some of Las Vegas’ best and most affordable entertainment, First Friday is the way to go. It’s always free to attend and observe and even when you start to work up an appetite, food and drinks are so affordable that you won’t worry about running your bank account dry before the weekend has even started. In the mood for even more free Las Vegas entertainment? 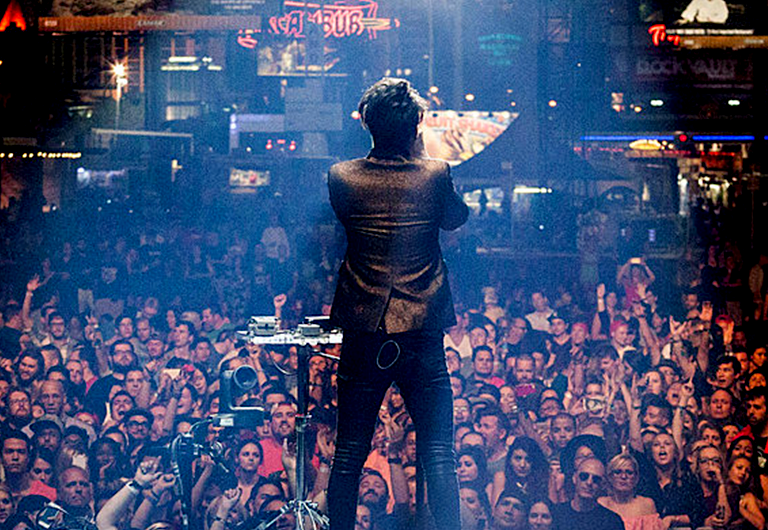 There’s always plenty of live music at the Fremont Street Experience, including a free concert series in the summer that caters to nearly all music tastes. This summer, Downtown Las Vegas welcomed Billy Ray Cyrus, Molly Hatchet, The Cult, and many more. You can’t have a splurge night in Las Vegas without seeing a show on the Strip. If you haven’t had the pleasure of seeing any of Vegas’ mind-blowing spectacles, start with the absolute best. 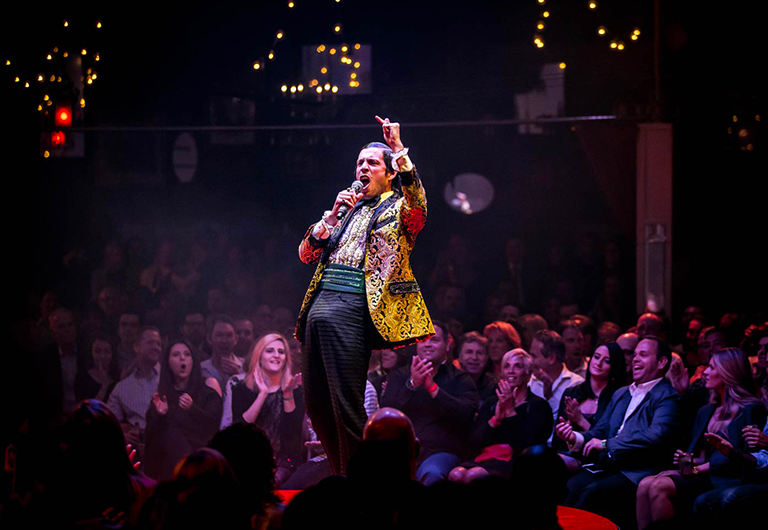 Absinthe has been named by the Las Vegas Weekly as the number ONE greatest show in Las Vegas entertainment history … that’s huge! With an up-close-and-personal circular stage and a hilariously raunchy cast, this show is not for youngsters or the faint of heart (so you know it’s got to be good). Absinthe has the entertainment ABCs, acrobatics, burlesque, and cocktails, completely covered for a heart-racing night out. Tickets range from $100 to $200, or you can buy a Premium VIP or Impressario’s Reserve ticket to sit even closer to the action. This splurge show is totally worth it. If you’re itching to get really fancy for a night out on the town, there are few spots ritzier than The Cosmopolitan. Just walking around and absorbing all the glitz might be enough, but if you’re ready to have a true splurge Las Vegas experience, there’s no better place to do it than in the middle of a three-story chandelier dripping with shimmering Swarovski crystals. Appropriately named, The Chandelier is a multi-leveled treat for your eyes and taste buds alike. It’s a glimmering structure perched high into the ceilings of The Cosmopolitan that offers sophistication and mystique to each and every one of its guests. Just one cocktail will cost you around $20, but their speciality concoctions make your whole mouth tingle with delight. 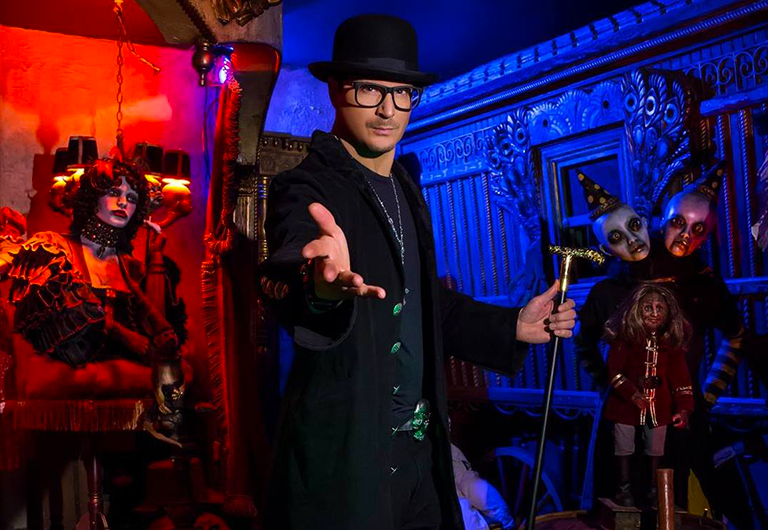 With Halloween fast approaching, get a head start on your spooks by visiting Zak Bagans’ Haunted Museum! Quite possibly too close for comfort, Zak’s Haunted Museum is located Downtown on 6th and Charleston, less than a mile away from your condo at Juhl. If you’re a glutton for ghosts and ghouls, this adventure is totally worth the $44 ticket price. When walking through a house full of creepy dolls and cursed contraband, be sure to burn a few bushels of sage when you get home! Always full of surprises, Las Vegas is the perfect place to call home for all personalities. Whether you prefer to lounge and sip cocktails or witness heart-pounding theatrics and thrills, there will always be entertainment available to fit your budget.